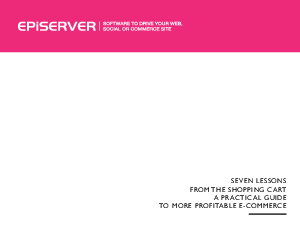 White Paper Published By: EPiServer Inc.
E-commerce is everywhere. More people are shopping for a greater variety of products than ever before. And while some countries are ahead, in all developed economies it is a matter of when, not if, e-commerce will become a significant revenue stream for every retail business. In this guide, we'll look at seven lessons today's retailers should learn if they are to gain maximum benefits from their e-commerce operations. Together, these lessons can help take your e-commerce operation forward enabling you to capture more sales, more often.